Sam Smith Park has been losing a number of benches over the past few years due to wear and tear and sometimes vandalism. The Parks Department's budget is tight and the replacement of those benches and the addition of, hopefully, more will take time. 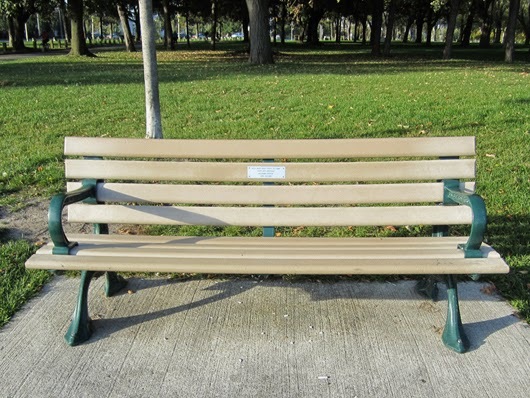 The City's Commemorative Tree and Bench Program invites the public to pay tribute to a person, group or occasion by purchasing a park bench or tree for installation in a public park. Fees are considered to be donations and are tax deductible. Click here for a link to the programme. Any person wishing to donate a tree or bench in a City park must complete a CT&B Program Request form from Parks, Forestry, & Recreation. For spring planting the application deadline is April 1. For fall planting the application deadline is September 1. The CT&B Program covers its costs with an application fee of $738.00 for a commemorative tree and an application fee of $2,530.00 for a commemorative bench. The existing bench application fee of $1,753.00 will be charged when a commemorative plaque is added to an existing bench. Plaques will be provided for both commemorative trees and benches at no additional cost and will be provided after installation is completed. Commemorative trees will be hardwoods (50-millimeter caliper) and conifers (250-centimeter height) with few exceptions. Commemorative Trees will be replaced by the City, at no charge to the applicant, within five years of the original planting date or a subsequent replanting date if required. Commemorative benches and associated plaques will be maintained by the City for a maximum of 10 years and 2 years respectively, at no cost to the applicant. Bench repair/replacement after 10 years will be at the City's discretion. Plaque repair/replacement after 2 years will be charged to the applicant. The approved location of a planting site or bench installation depends on proposed future development within a park, the location of underground utilities, and other site restrictions. Some parks may already be at capacity and therefore a tree or bench may not be made available for such a park. Tree planting or bench installation dates cannot be specified due to weather, grower supply, parks construction and special events situations. Choice of tree species, planting sites, and bench installation sites are subject to City approval. If a planting location and/or tree species or bench location cannot be mutually agreed upon, the application fee will be refunded. The donation is tax deductible. Due date for a tax deductible receipt for the current year is December 1st. Please complete the Commemorative Tree and Bench Program Request Form, submit along with a cheque or money order payable to 'Treasurer, City of Toronto' and submit to the address indicated on the form. Written confirmation will follow after installation is completed. For further information on this program please contact Ruby Goulart at (416) 395-6028 or email commemorativeprogram@toronto.ca. 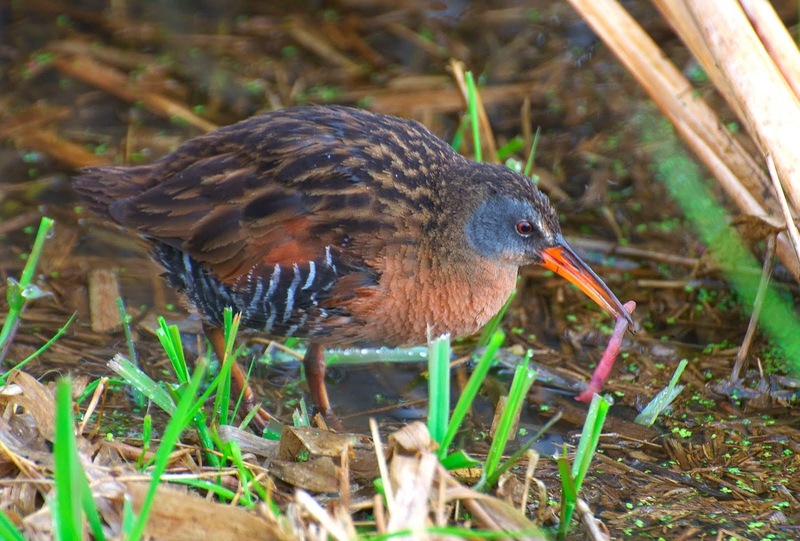 This week, birders discovered three secretive marsh species in Sam Smith Park - Least Bittern, Sora and Virginia Rail. These birds are hard to spot and difficult to photograph. 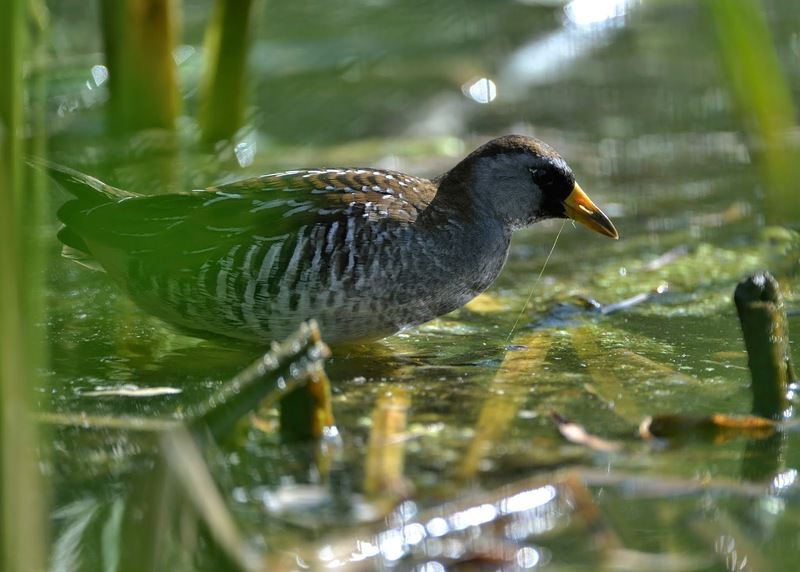 The birds, along with the recent Yellow-Crowned Night Heron and many others, illustrate the importance of our little park as it grows in to maturity to birds and the enthusiastic birders and photographers who visit in growing numbers. Thanks to those who submitted the pics. SAM SMITH PARK BEING STUDIED BY CITY FOR DESIGNATION AS AN "ENVIRONMENTALLY SIGNIFICANT AREA"
City staff have prepared a report for the Planning and Growth Management Committee proposing action on an Official Plan Amendment to add additional Environmentally Significant Areas to the City's natural heritage system. Sam Smith Park is one of them.
" ... critical areas within the City's natural heritage system. They contain habitats of large size or unusually high diversity, provide habitats for rare species; contain rare landforms, and serve as stop over locations or concentration points for migratory wildlife. These natural treasures are particularly significant and sensitive and are given the highest level of protection in the Official Plan. Development is not permitted in ESAs and activities are limited to those that are compatible with the preservation of their natural features and ecological functions." Sam Smith Park certainly fits that description and increased protection of the natural areas of the park is part of Friends of Sam Smith Park's mission statement. "It is recommended that four (4) combined open house/community meetings be held during November 2014 to review the proposed amendment. A report on the outcome of the consultation and a final proposed amendment will be submitted to Planning and Growth Management Committee in the first half of 2015." The writer of the report (on behalf of Jennifer Keesmaat, City Chief Planner) is Joe D'Abramo who is about to retire. His duties have been taken over by Klaus Lehmann who can be contacted at (416) 392 0175 or by email. It might be a good idea to contact him and ask to be notified of any developments on this file and for a heads-up on the community meetings. FOSS will also monitor this and pass on information to our contact list. Get your camera ready because the City of Toronto, Parks, Forestry and Recreation division is hosting a photo contest! Keep in mind that Friends of Sam Smith Park will be also holding our second annual photo competition in 2015, winners to be announced at the Spring Bird Festival mid-May - click here to see last year's winners and click here to see the runners-up. What is it that inspires people to care about the natural environment and the creatures who live in it, particularly when it comes to those nearby green sanctuaries so familiar to us? Friends of Sam Smith Park members are “dedicated to protecting, enhancing and preserving the naturalized areas” of our park but understand that digging in and making it better here is just part of a much larger and vital picture. Today marks the death of the last known Passenger Pigeon - exactly one hundred years ago. 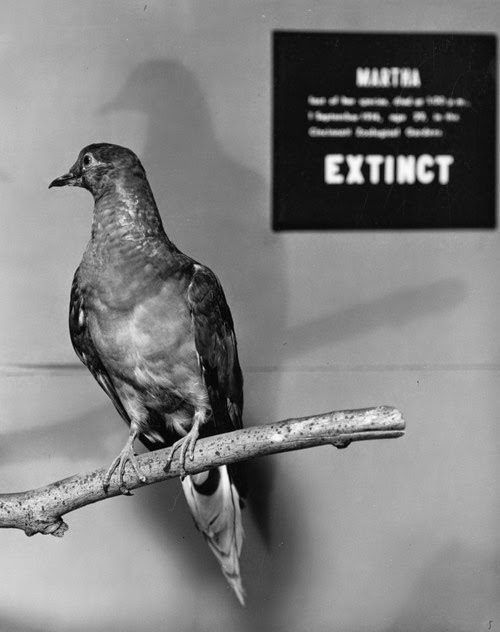 “Martha” had lived her whole 29 years of life in captivity at the Cincinnati Zoological Gardens and died on September 1st 1914. Immediately following her death, she was packed in an enormous 300-pound block of ice and shipped to the Smithsonian in Washington where her skin was mounted and displayed. People lined up to see her. She was a “star”. The passenger pigeon was once the most common bird on the continent, numbering in the billions (estimated at numbers exceeding 5 billion), consisting of forty percent of the continent’s entire bird population and thought to have been the most numerous species in the world. 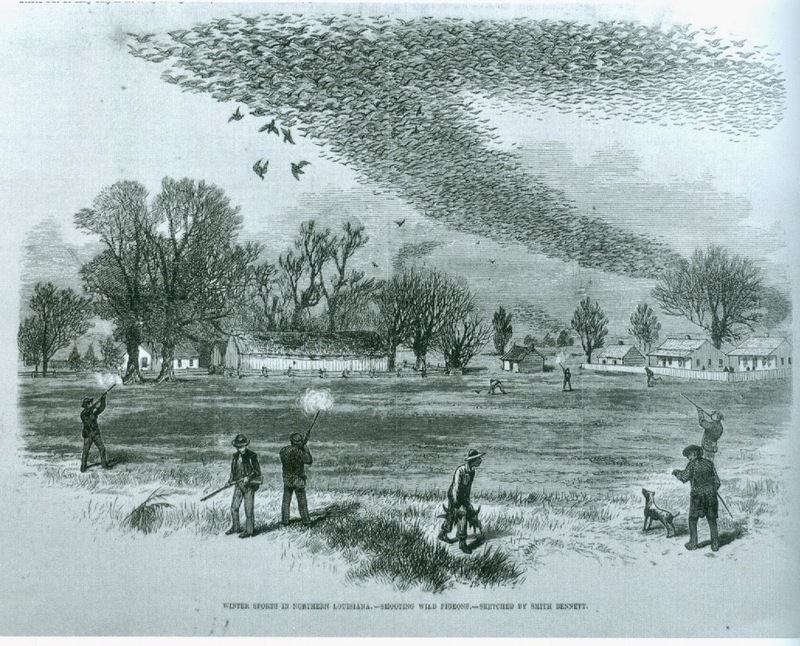 Passenger Pigeons lived in enormous colonies with sometimes up to 100 nests in a single tree. Migrating flocks stretched a mile wide, turning the skies black. Unfortunately, they were considered pests that ate precious grain crops. They were also tasty game, and were hunted both as sport and for the market. There was also the intense cutting down of eastern forests - their feeding and breeding grounds. Their extinction was predicted in the 1870s, and was complete in the wild within about twenty-five years. The Passenger Pigeon had gone from billions of birds to zero in about one century, probably less. Their extinction is an important part of the largely untold story of the ecological annihilation of the continent in the latter half of the 19th century, a time that saw an unprecedented loss of natural beauty and richness as forests were felled and the prairies were ploughed, with wildlife slaughtered more or less indiscriminately. Nearby Mimico is a First Nations word for the area - Omimeca, meaning "where the pigeons gather". The diversified hardwood and evergreen forest bordering Mimico Creek was a preferred and busy nesting place for the birds because of its abundance of seeds, nuts, berries and roots. Flocks would occupy many square kilometers within the forest. Every tree would have so many nests that their branches often broke under the weight of multiple young birds. 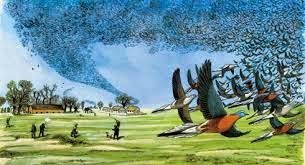 The migrating flocks were once so huge it was said that a single flock could darken the sky for up to three days and filled the air with the roaring sound of their flapping wings. These birds were so plentiful at Mimico Creek that there were reports that dozens of birds could be felled with one buckshot. Birds were often enticed by hunters to land in selected spots by attaching the legs of a blinded pigeon to a stool fitted with a lever that could be moved up and down causing the bird to flap its wings. 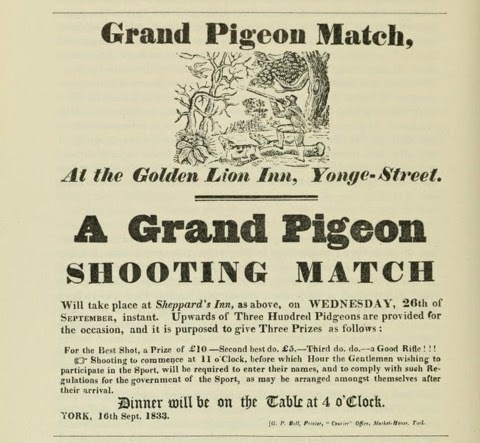 Unsuspecting pigeons would land to be netted, clubbed or shot by pigeoneers and then shipped off by the train loads to fancy restaurants in Boston, Toronto, Montreal and New York. (This practice gave us the term “stool pigeon”.) During the breeding season, squabs (young fledglings) would be tipped out of their nests with long poles and barreled up for shipping. They were considered the tastiest. The annihilation of the Passenger Pigeon was the first “public” extinction, something people used to think happened only to relics of the past like dinosaurs and dodos. It was a real wake-up call. In 1897, the Ontario government finally included Passenger Pigeons in the category of "wild native birds" that qualified for protection. By then there were virtually none left to protect. The last sighting of Passenger Pigeons in the Toronto area was reported unofficially in 1900, when five were observed flying over the Toronto Islands. After several years of negotiations, the United States and Great Britain (on Canada's behalf) signed the Treaty for International Protection of Migratory Birds in 1916. 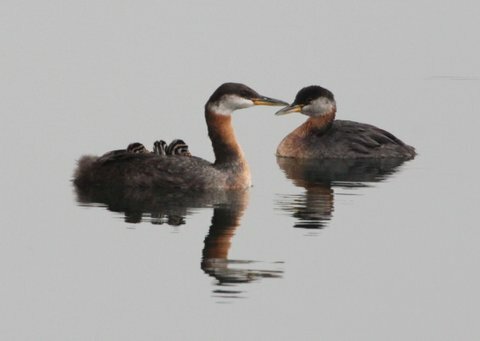 In the following year, the Canadian Parliament passed the Migratory Birds Convention Act, which has played a key role in preventing the extinction of numerous other species of migratory birds. Despite the underlying theme of loss in Martha’s story, it is more than another depressing tale of human greed and ecological stupidity. It contains an underlying message – that we need to re-forge our relationship with the natural world. Otherwise more species will go the way of the Passenger Pigeon. We should listen to the message from Martha. NOTE: There is a terrific book published this year by naturalist Joel Greenberg who relates the story of the Passenger Pigeon in gripping detail. It is titled “A Feathered River Across The Sky” and is available from the Toronto Library.